Nintendo have just released a document filled with goodies about upcoming games and titles and what maybe encouraging to know is that they are not dropping the Nintendo 3DS family of systems just yet as they will be bringing a New Nintendo 2DS XL handheld to the world on July 28th in most regions. It will not have the same look as the original 2DS (Thank heavens) and will look more like the 3DS model but without the 3D mechanic. It is to be a more cost effective way to entice more people new to gaming and children but still has the processing power of the New 3DS. It currently comes in two colours, White & Orange and Black & Turquoise. Some regions may only have a particular colour schemes (For example, the US will only have the Black & Turquoise model). “As you can see, we are adding New Nintendo 2DS XL to the lineup of systems in the Nintendo 3DS family. Just like New Nintendo 3DS XL, which is currently available, New Nintendo 2DS XL has a clamshell design. 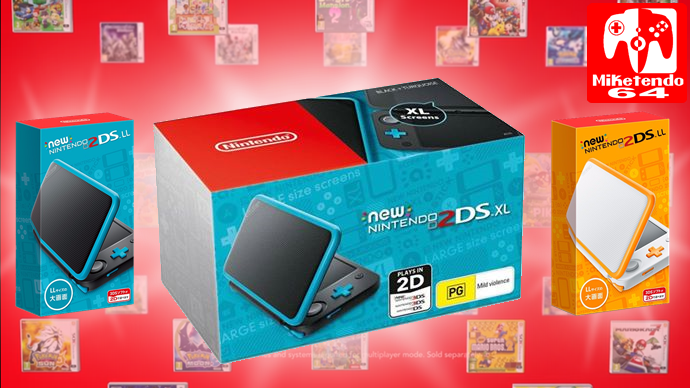 It also has the same large LCD screen as New Nintendo 3DS XL and is a lightweight system for improved portability. Players can enjoy the more than 1,000 Nintendo 3DS software titles available in Japan on a 2D screen. Other than the fact that the screen displays in 2D, New Nintendo 2DS XL has the same basic capabilities as New Nintendo 3DS XL. Note: The New Nintendo 2DS LL will sold outside of Japan as the New Nintendo 2DS XL. The New Nintendo 2DS XL will launch in Japan, the U.S. and Europe in July. In Japan, it will have a manufacturer suggested retail price of 14,980 yen (tax not included). In the U.S., the MSRP will be $149.99. As a reference, the MSRP for the current New Nintendo 3DS XL is 18,800 yen (tax not included) in Japan, while it is $199.99 in the U.S. We can say that the New Nintendo 2DS XL will be offered at a more affordable price. It broadens the options available to consumers, whether they are looking for their first handheld system, or want to add a second or third handheld system for the family.